so you can perform at your peak in games! You might be the most skilled player on your team and train harder or longer than anyone else, but if self-doubt enters your mind prior to or during competition, you simply will not reach your true potential in soccer. If you are ready to improve your mental toughness and perform with ultimate self-confidence in games, we have a program that will do just that. Digital Download: $20 Off + No Shipping! Having helped our personal coaching students overcome these challenges, you too can discover the top mental game strategies we have taught to club, academy, college, and professional soccer players! Jaki Hitzelberger specializes in sports psychology for soccer players. She is a certified Mental Game Coaching Professional. She participated as a scholarship athlete at The University of Florida and Rollins College women’s soccer team. She works with high school, college, and professional soccer players to improve their confidence, focus, and other mental game challenges that block success. We’re on a mission to teach you proven and effective mental game strategies so you can overcome any mental barrier, take your practice game to competition, and boost your confidence in soccer. We won’t waste your time by boring you with psychobabble or fluff! Just simple, proven mental game strategies to help you perform at your peak! The best part is that you too, can tap into our expertise and experience coaching athletes to improve their mental game over the past two decades – so you can perform your best in practice, games, and tryouts! 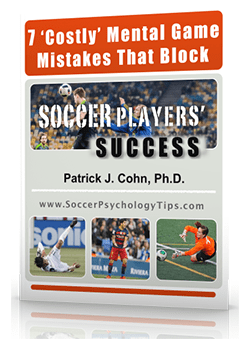 You’ll learn the top eight mental game lessons for soccer players – the same lessons we teach our personal coaching students, who pay thousands of dollars for our strategies. We’ve made sure that our lessons are easy and effortless for you to improve your mental game. Who Should Purchase “Soccer Confidence”? 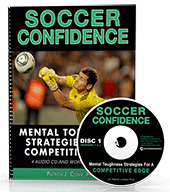 “Soccer Confidence: Mental Toughness for a Competitive Edge” CD and Workbook program is ideal for any club, academy, college, or professional soccer players. In addition, soccer coaches, instructors, and parents would also be wise to teach the strategies we provide in “Soccer Confidence” to their players. What’s Included In the “Soccer Confidence” Program? “Soccer Confidence” is a complete brain dump of the TOP eight mental training sessions we teach our soccer players to help them boost their mental game and improve consistency – from how to mentally prepare for games to performing under pressure to building unstoppable confidence. One “Soccer Confidence” workbook to guide you through my mental toughness sessions and to overcome mental game roadblocks. Eight “Soccer Confidence” Post-Game Assessments to help assess how you are doing and provide the answers to make any adjustments with your mental game. Instantly Download Your Bonuses Immediately After Placing Your Order! You get eight pregame audios to review the most important mental strategies for each of the eight mental game sessions. Repetition is key to learning the mental game (bonus value = $50.00). An entire bonus session on how to get the most out of your training. Learn how to get maximum benefit from your practices. You’ll learn how to best improve your skills and mental game (bonus value = $50.00). Includes an assessment that will help you identify what prevents you from playing aggressive. Also includes a worksheet to help you improve you intensity in practice and games (bonus value = $20.00). Parents, learn what to say before and after games to support your athlete’s confidence, focus, and composure (bonus value = $30.00). Coaches, this checklist gives you great tips on how to ensure your players are mentally prepared for competition! (bonus value = 30.00). Total VALUE of Bonus Package: $180.00! What’s the Cost of “Soccer Confidence”? 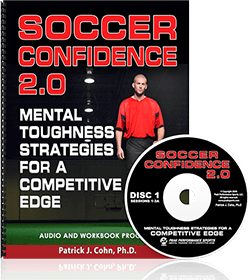 “Soccer Confidence” 4-CD and Workbook program is the most comprehensive mental game program we’ve offered to the public. We’re virtually giving away all our mental game secrets for the incredibly low price of only $197.00 including the free bonuses! This is our way of saying “thanks” to our loyal Soccer Psychology subscribers! We stand by our work 100%… we never want you to feel like buying the “Soccer Confidence” CD and Workbook program is a gamble. Embrace my strategies and apply it 100% to your game. If you’re not happy, for ANY reason in the next 30 days, just contact us by email or phone, return the CDs and workbook and we will buy it back. You’ll get a courteous refund of every penny! Does that sound fair? Thank you for taking the time to read about the “Soccer Confidence” Audio CD and Workbook Program – the best value to rocket your confidence, focus, and composure to new heights. Please contact us if you have any questions!